Munira (left) is a graduate of ISC in Baking Practices, 2014; and continued to ITE NITEC in Baking Practices in 2015 at ITE College West. Kia Yi (right) is a graduate of ISC in Hospitality Services, 2014; and continued to ITE NITEC in Asian Culinary Arts in 2015 at ITE College West. We are proud to announce that both of them successfully completed their NITEC Courses in March 2017. 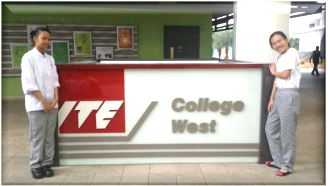 Eight of our graduates are accepted into ITE. Ten of our graduates are accepted into ITE.